Some railfans wish they lived in southern California. Others were fortunate enough to have been born there. Tom Gildersleeve, Gordon Glattenberg, and the late William H. "Hank" Mills are among the latter. The photographic trio began their exploration of the Southland in the early 1950s, when profound societal and technological change began to sweep the Golden State. Beyond the Technicolor dreams Hollywood was sending around the world, citrus groves were steadily giving way to industrialization and suburban sprawl. An expanding web of freeways was turning trolleys into antiques, while colorful new diesel locomotives steadily took the reins from steam's iron horse. Transition was in full flower, providing the authors with intriguing subject matter cast against a wide array of dramatic settings. At a time when most photographers documented the industry in black and white, Gildersleeve, Glattenberg, and Mills made Kodachrome their film of choice, opting for a medium that could realistically capture the full palette of their surroundings. Popular publishing was predominantly a monochrome enterprise, providing few opportunities for color shooters beyond slide shows at private homes and railroad club meetings. It would be the mid-1970s before new technology allowed all three of the authors to reach a wider audience. The decision to concentrate on color photography might be construed as an act of faith, with little reward beyond the satisfaction of a job well done. As this volume will attest, that faith has been rewarded on a grand scale. Some 345 color images invite inspection, the majority of them being published for the first time. Focusing on the years between the mid-1950s and late 1960s, Southland takes the reader on a wide-ranging tour of the region between Bakersfield and the Mexican border. 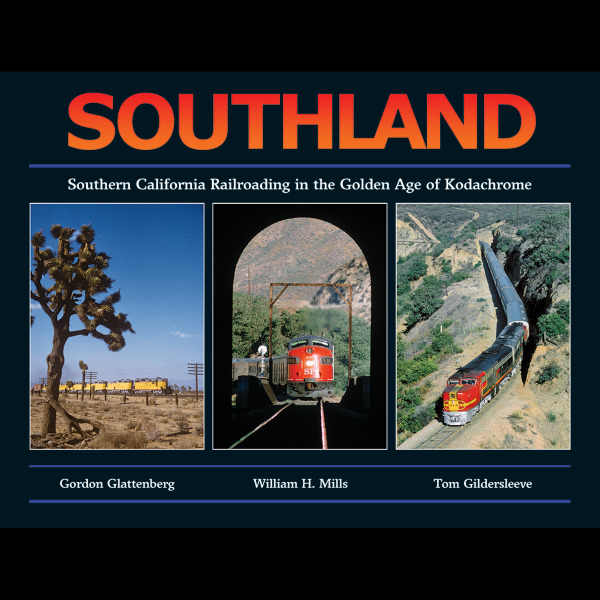 Six chapters and eight detailed maps, with comprehensive captions by award-winning photojournalist Ted Benson, convey the excitement of Southern California railroading in the golden age of Kodachrome.